Blackman's Coffin by Mark de Castrique, a Mysterious Review. Review: Mark de Castrique, author of the so-called "Buryin' Barry" mysteries, takes a risk starting a new series featuring Iraqi war veteran Sam Blackman with a plot that easily could have featured his other series character, family undertaker Barry Clayton, inevitably inviting comparison between the two. Yet the risk pays of handsomely; the outstanding Blackman's Coffin will certainly be remembered as one of the best mysteries of the year. Sam Blackman lost part of his leg in Iraq. Fitted with a prosthetic, he's alternately bitter that his future activities may be limited and hopeful he'll be able to successfully adapt. While recuperating in the hospital, he's visited by another veteran who's also lost a limb, in this case an arm. Tikima Robertson has a no-nonsense attitude that Sam admires. Upon leaving, she says she'll see him in a few weeks. Those weeks pass and Sam's disappointed that Tikima never returned. But for good reason: she's been murdered. Sam meets Tikima's sister Nakayla and together, with a mysterious journal found in the dead woman's apartment, they set out to find out not only who killed Tikima, but why. The author takes another risk in the first chapter of Blackman's Coffin by creating a uniquely memorable character then promptly killing her off. Yet she maintains a constant presence, and even a powerful influence, throughout the book. In his eulogy for Tikima, Sam says, "But I had to come [to the funeral service], not because I knew Tikima for ten years or even ten months, but because I knew her for only ten minutes. That was long enough for her to make an impression upon me. An impression that for those ten minutes my health and attitude were the most important things in her life. She challenged me." She'll do the same for the reader. The murder investigation is related to an old journal purportedly written nearly 100 years ago by a young boy who, coincidentally, had lost his leg in a hunting accident. In a number of astonishingly clever plot twists, Sam and Nakayla learn how the past meets the present and that they're really investigating two murders: that of Tikima and her (and Nakayla's) great-great-grandfather. It's not too much of a stretch to guess how the murders are related and fortunately Sam, too, quickly makes the connection. It isn't long before they're setting a trap to nab the killer. 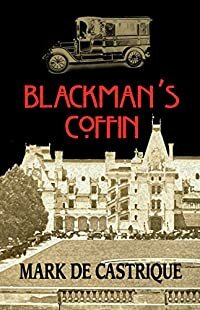 Blackman's Coffin is a terrific mystery embedded in a well-crafted tale with a fascinating historical background, and is populated with richly drawn, interesting characters that readers will want to see again in future stories. Acknowledgment: Poisoned Pen Press provided an ARC of Blackman's Coffin for this review.